The NEW Blackstone 36" Griddle Cooking Station with Accessory Side Shelf comes equipped with our new and improved side shelf giving the user a removable cutting board, convenient paper towel holder, and strategically placed trash bag hooks. PLUS Blackstone's new rear grease management system to help eliminate mess. Great as advertisedThe grill was very easy to season and after two layers of seasoning, it already made a great non-stick service. I dislike putting stuff together, but when it arrived in its box, most of it was already assembled. I had it completely together in 20 to 30 minutes, very easy. best.griddle.ever.We used our black stone griddle for the first time last night. We love it so much and look forward to using it again. Also love it better than a grill! Love my new Blackstone!I have been wanting this griddle since I used my sistets 17" last summer. I finally ordered the 36" right after Christmas. It arrived in about 2 days..I had it together in 30 minutes and ready to season. I LOVE this griddle. I've made breakfast foods, steak' and burgers, Philly Cheese Steaks..easy clean up and everything tastes so good! A great addition to my outdoor kitchen!.. I live in Ohio and grill and or cook outside all year round! I can honestly say that this will be used more than my grill or smoker! Natural GasI have not purchased one yet. Can this griddle be converted to use natural gas? Absolutely!Our current Natural Gas Kit is designed to work with any and all of our large griddles. There are more than enough orifices to give you options if you had more than one of our products. NEW FEATURES – This unit comes equipped with Blackstone’s new and improved side shelf giving the user a removable cutting board, convenient paper towel holder, and strategically placed trash bag hooks. PLUS Blackstone’s new rear grease management system to help eliminate mess. 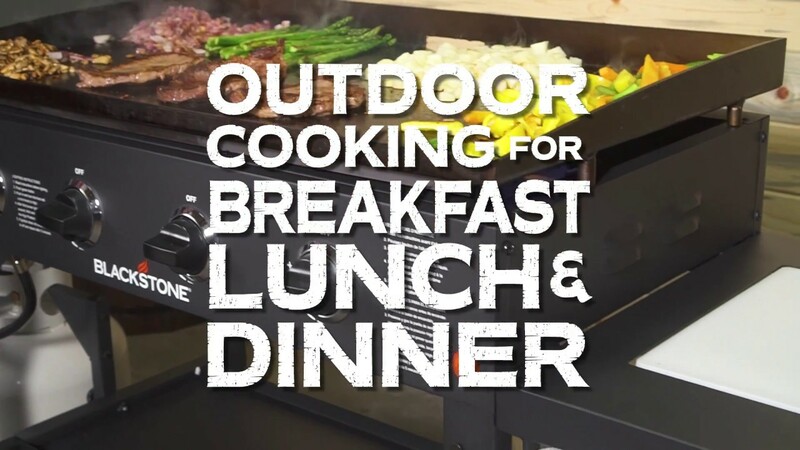 RESTAURANT STYLE COOKING – With 720sq inches of flat top grilling, this griddle is perfect for breakfast, lunch and dinner. Cook eggs, pancakes, quesadillas, grilled cheese, steak, potatoes, teppanyaki style foods and more. Also enjoy a bottom shelf, side shelf and the NEW side shelf with cutting board, paper towel holder and trash bag hooks.